Over the past few days, Chad has been going through some of his old Boy Scout stuff. Caroline has been very interested in the hats and sashes and patches, etc. 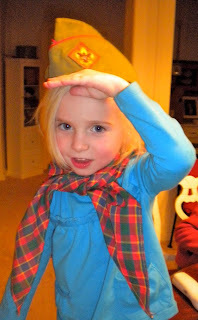 Here are a couple of pictures of her in Chad's Boy Scout stuff.